Those of us that are passionate about what we do, we all wish there was a secret recipe to working smarter and not harder. If you enjoy reading, you’ve probably come across a few books or blogs with some idea hacks that might have helped, or at the very least, given you some helpful insight. You may have tried a few of them, and maybe you were lucky enough to see a noticeable difference, but were you really happy with the results? Are you happy with your work/life balance? and, Do you feel accomplished at the end of every work day? Look, I get those questions are tough to answer. Some of you may go as far to say you’re already awesome and there’s nothing to change. However, the winning and competitive attitude always looks to improve and get better results. Personally, I know I wasn’t happy with my work efficiency up until a couple years ago. So, what did I do to change that? My friends, family, some colleagues, and even a few clients know I have a love for books. I’ve always had that student mindset, the notion that I will never know enough, and the hunger to always learn more. With my thirst for knowledge, I discovered an amazing book; The ONE Thing: The Surprisingly Simple Truth Behind Extraordinary Results written by Gary Keller of Keller Williams Realty. This brilliant man has accomplished so much in his life and career in real estate. It’s funny, you would think with his successful career that there would be some complex process to his success but Gary explains it so easily with simple ideas. So, what’s my take away from The One Thing that helped me worked smarter and not harder? In the book, Gary covers everything from multitasking and living a disciplined life, to willpower and how to live productively. I love the way Gary breaks this down in 3 parts beginning with The Lies, The Truth, and Extraordinary Results. So, what did I take away from the book The One Thing? 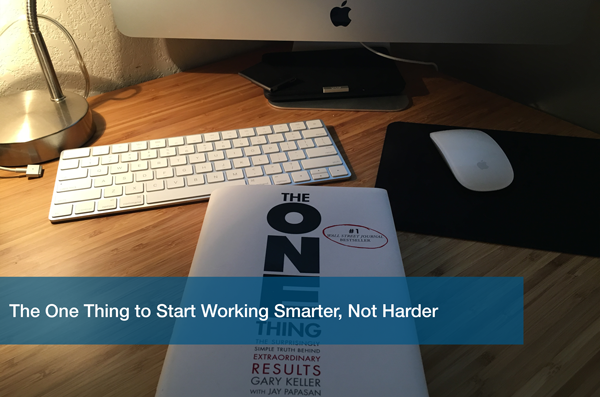 To start working smarter, and not harder you need to focus on one thing. Focused thought, to put everything you have in getting one thing done efficiently, and effectively. As explained by Gary Keller, “focus on the one thing that you can do such that by doing it everything else will be easier or unnecessary”. Gary explains to create a success habit of asking yourself a focusing question about the task and it’s impact on your productivity. Asking a focusing question can help you discover your most leveraged priority, make the most of time management, and get you the best return on your investment – your time and energy. By implementing a focusing question, you can make success a habit. Our day-to-day life is a habit. A strong formed habit that hardly changes or makes any real difference. These habits of life and the people that create them hate change. They absolutely fear it. So much that they create excuses as to why it works for them, or why it doesn’t need to change. Those of us that accomplish more have learned to challenge it, change it, and improve it. Start working smarter, not harder. Start asking yourself a focusing question to have a better work/life balance, get more accomplished, and to achieve better results. Start today, by ordering your copy of The ONE Thing: The Surprisingly Simple Truth Behind Extraordinary Results. What’s the one thing I can do to improve a skill? Whats the one thing I can do to find time for myself? What’s the one thing I can do to hit a goal? Whats the one thing I can do to help my team? Whats the one thing I can do to make us more competitive? Whats the one thing I can do to improve our customer experience? Whats the one thing I can do to make us more profitable? Start working smarter by asking yourself a focusing question – use the examples I’ve listed above to help you. Do the one thing that has the best value and return on your time and energy investment. Make success a habit, get started now! If you buy the book, let me know what you think on Twitter @itcaustin. If you enjoyed this article, let me know in the form below. Thanks for reading!